WUSF Public Media presents the premiere screening of the documentary film on the 2012 Florida Wildlife Corridor Expedition. 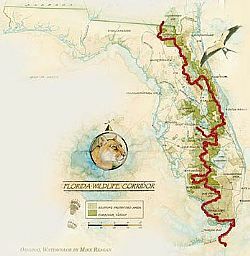 The 3-month expedition traversed the wildlife habitats, watersheds and working farms and ranches from the Everglades to Okefenokee which comprise the Florida Wildlife Corridor opportunity area. Team members will be on hand for Q&A session following the screening. The film will be projected on an outdoor screen in Cotanchobee Park, next to the Tampa Bay History Center; bring lawn chairs or blankets for seating. Admission is free.